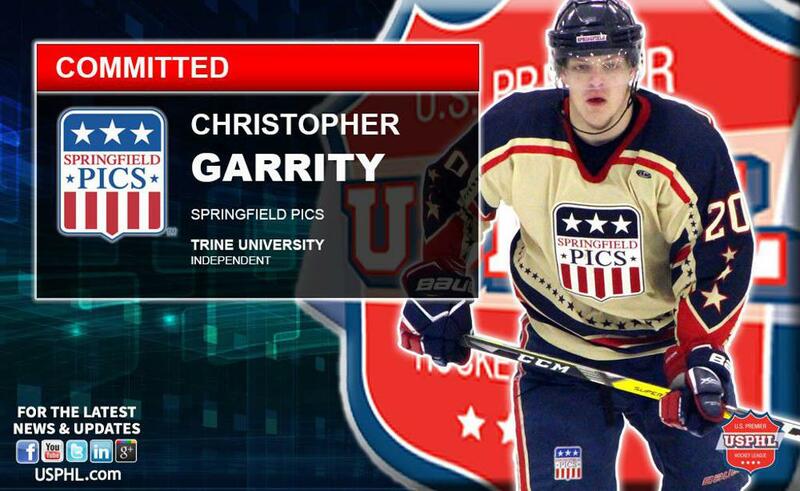 WEST SPRINGFIELD, Massachusetts— The Springfield Pics are proud to announce that defenseman Chris Garrity has committed to Trine University for this fall. The Stafford, Massachusetts native scored three goals and added nine assists for 12 points from the Pics blueline in 43 games this season, after notching seven helpers in 40 games the season before. “I am proud to announce that I will be playing for Trine University. I would just like to thank my parents, Coach Tabb, and the whole Springfield Pics organization for helping me achieve my goal of playing NCAA College hockey,” Garrity said. “We would like to congratulate Chris and his family on this accomplishment. Chris joined our program from the Baltimore Skipjacks. For two seasons he was a shut-down defenseman willing to block shots, finish his checks every shift, play through injuries, and sparked our club with his toughness and energy. Chris was always looking for the extra ice to improve,” Pics head coach and general manager Patrick Tabb said. The Thunder play in the highly competitive Northern Collegiate Hockey Association, and will begin play for the 2017-18 season in the brand-new Thunder Ice Arena. A player like Garrity is a perfect fit for a program that wants to compete right away, Tabb noted. “Trine University is a great fit. They have shown a huge commitment to the hockey program with a multimillion dollar arena on campus and bringing in a veteran coach in Alex Todd to build the team. It’s the same type of commitment Chris brings on and off the ice,” he said.